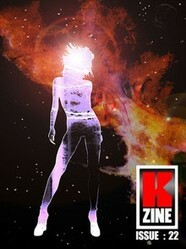 The September 2018 issue of the Kindle and print-on-demand science-fiction, fantasy, crime and horror magazine KZine contains seven original stories by Mark Bilsborough, Peter DiChellis, Ryan Fitzpatrick, Ken McGrath, Ana Gardner, EV Morozov and Louis Palmerino. The cover art was by Dave Windett and the magazine was edited by Graeme Hurry. There are seven short stories in the September 2018 (Issue 22) issue of KZine, a science-fiction, fantasy, crime and horror magazine for the Kindle. Now, I like dark stories and that is what you get in “The Floating of the Dead” by Louis Palmerino, by far the best story in this issue, and that is saying something given the high quality of the rest. The magazine brims with writing talent from Ryan Fitzpatrick’s psychic opener to Ana Gardner’s happy ending. Pull up your mobile device, relax on the sofa and enjoy a damn good read. A cracking start to the issue, a real page turner in what started slowly but intriguingly. The man in the office was testing for psychic abilities, and the young woman in front of him had just what he needed. But who was testing whom, and why? The second story also focuses on psychic skills, this time between two brothers – Charlie and Zack. Their link was instantaneous no matter the distance, even across the vast areas of space. This made them precious to a space agency mission, but so they would be the same age when Zack reached his destination, both would have to go into cryo for fifty years. When they awoke, all was not as expected. This is as much a story of loneliness and companionship as it is about space travel, and good for it. When a struggling actor agrees to impersonate Trevor and Vivian’s lost son, he believes it is just to give comfort to a bereaved couple. A sad little tale with a nice twist. At first glance, Brian and Robbie looked like two ordinary guys doing some work on a rundown Victorian house in Dublin. But when Brian burned a hole in a rude man’s suit from a distance, it was clear all was not as it seemed. The two were battling a demon in the house; all good stuff. But that they’d overlooked something was too clearly telegraphed and the ending was a bit weak. Eight-year-old Blackthorn had an abusive father, but did the magician Vermillia offer her a way out, and at what cost? This is a dark story, a very dark story, dark literally to the last word. Wow! A must read. Flesh wards are a controversial way to reanimate dead people. Dr Serin practices the art, and sometimes to a degree more than is legally allowed. When a corpse, still energised from an illegal probe, gets up and kills someone, Serin has a problem. This is a story about ethics and how to use them to your advantage. The way out of Serin’s dilemma is revealed cleverly. Shraa had crashed her ship into the Earth and was in need of fuel and repairs. Unlucky for Frank, it was his late night store she picked to find what she needed. If that wasn’t bad enough, the Grumms turned up chasing her, and they were armed. A bit of fun to finish the issue, high speed and played for laughs.